Chiwetel Ejiofor in a scene from "12 Years A Slave." The film was nominated for a Spirit Award for best feature on Tuesday, Nov. 26, 2013. The Spirit Awards will take place Saturday, March 1, 2014. 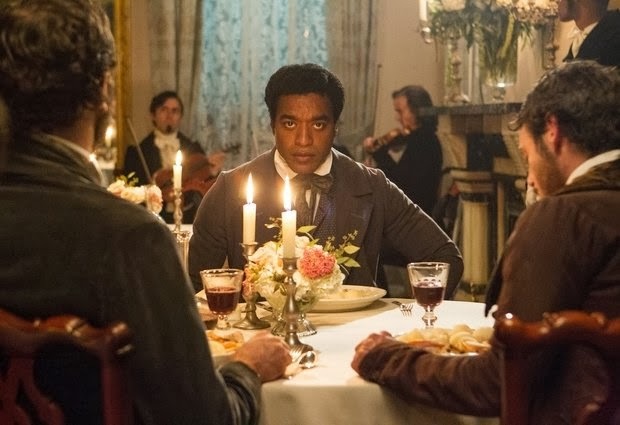 LOS ANGELES (ASSOCIATED PRESS) — The race to Oscar has officially begun, as the slavery exploration "12 Years a Slave" was nominated Tuesday for a leading seven Spirit Awards, which honor independent film. The Steve McQueen-directed drama is up for best feature, best director, best actor (Chiwetel Ejiofer), best supporting actress (Lupita Nyong'o), best supporting actor (Michael Fassbender), best screenplay (John Ridley) and best cinematography (Sean Bobbitt). With six nominations, Alexander Payne's black-and-white comedy "Nebraska" is also in the running for best feature, best director, best actor for Bruce Dern, best supporting actress for June Squibb, best supporting actor for Will Forte and best first screenplay for Bob Nelson. Other best-picture contenders include J.C. Chandor's near-wordless shipwreck drama "All is Lost," Noah Baumbach's New York tale "Frances Ha" and the Coen brothers' folk music story "Inside Llewyn Davis." "All is Lost" also earned a best director slot for Chandor. Also up for best director are Jeff Nichols for the coming-of-age drama "Mud" and Shane Carruth for the sci-fi "Upstream Color." Along with Ejiofor and Dern, the best male lead category includes Oscar Isaac for "Inside Llewyn Davis," Matthew McConaughey for "Dallas Buyers Club," Robert Redford for "All is Lost" and Michael B. Jordan for "Fruitvale Station." Julie Delpy received two nominations, for best female lead and best screenplay for "Before Midnight," the third installment in the romantic drama series that kicked off with "Before Sunrise" in 1995. Delpy shares the best screenplay nomination with Ethan Hawke and Richard Linklater, who co-wrote the script. Among other best actress nominees are Cate Blanchett for "Blue Jasmine," Gaby Hoffmann for "Crystal Fairy," Brie Larson for "Short Term 12" and Shailene Woodley for "The Spectacular Now." Accompanying Delpy in the best screenplay category is Woody Allen for "Blue Jasmine," Nicole Holofcener for "Enough Said" and Scott Neustadter and Michael H. Weber for "The Spectacular Now." For his performance in the romantic comedy "Enough Said," James Gandolfini earned a posthumous nomination for best supporting male. Though the Spirit Awards were begun to honor lower-budget films outside of Hollywood's mainstream, there is often overlap, and particularly so this year. Many of the 2013 Spirit nominees are expected to be strong Oscar contenders. Higher-budget studio releases like "Gravity" and "Captain Phillips" don't compete in the Spirit Awards, which are limited to films with a budget less than $20 million. Last year, David O. Russell's "Silver Lining Playbook" swept the Spirit Awards, winning best feature, best director, best screenplay and best actress for Jennifer Lawrence. Presented by the cinema group Film Independent, the Spirit Awards will be handed out the day before the Oscars at an afternoon ceremony along the beach in Santa Monica, Calif., on Mar. 1. The Spirit Awards will air that night on IFC. Nominees were chosen by panels of film professionals. Members of Film Independent, including filmmakers and movie fans, are eligible to vote on the winners.